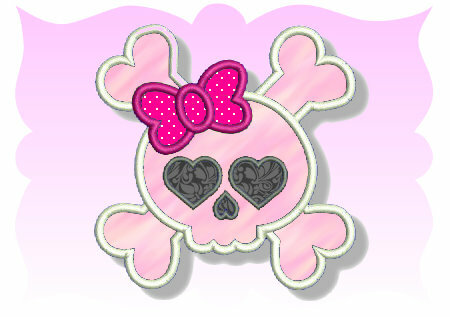 Sweet Girly Skull Applique - $4.99 : Fancy Fonts Embroidery, Home of the ORIGINAL Trendy Dots Font! This Sweet Girly Skull Applique is just so cute, and not just for Halloween! Perfect on any project for babies, teens and even adults! My daughter has already requested to have this on a t-shirt! This design comes in 3 sizes for the 4x4, 5x7 and 6x10 hoops! 4x4 hoop - 3.73 x 3.76"
5x7 hoop - 4.95 x 4.98"
6x10 hoop - 5.87 x 5.91"